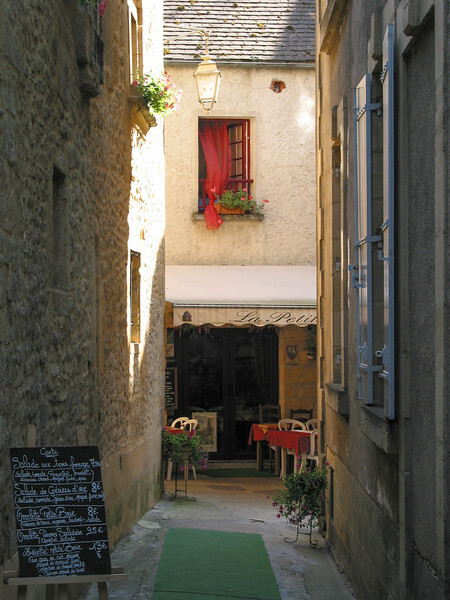 Sarlat is a very charming town, and capital of the Périgord Noir, just north of the Dordogne river. It was apparently a wealthy trading and argicultural town in medieval times, poor at the right time to avoid industrialization, and is now wealthy again, through the tourist trade. The Old Town maintains the plan constrained by the original walls, some of which remain. Sarlat is still famous for its Saturday market. It now makes a great base for exploring the castles and sights of this portion of the Dordogne, including the castles of Beynac and Castelnaud, and the villages of Domme and Roque Gageac, all of which we visited. It's also close to some of the great pre-historic sites, such as Lascaux and the village of Cro-Magnon. The cuisine of this area is famous, based largely on duck and goose, notably the famous Foie Gras, or liver of the fattened fowl, mostly processed in the form of pâté or terrine. Though foie gras is justly a delicacy, it has to be admitted that the process of fattening the birds to produce the enlarged livers doesn't bear much examination.